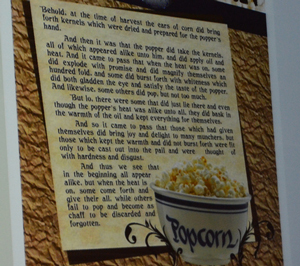 In honor of the start of Lent, we present “The Parable of the Popcorn” as read by National Corn Growers Association CEO Rick Tolman at the Commodity Classic corn banquet last week. This is a clever take on the biblical Parable of the Sower (Matt 13:1-23) and most on-line sources say the author is unknown. It’s about choice and accountability. To pop or not to pop, that is the question. Behold at the time of harvest, the ears of corn did bring forth kernels which were dried and prepared for the Popper’s hand. And then it was that the Popper did take the kernels, all that did appear alike unto Him, and applied the oil and the heat. And it came to pass that when the heat was on, some did explode with promise and did magnify themselves an hundred fold. And some did burst forth with whiteness which did both gladden the eye and satisfy the taste of the Popper. And likewise some did pop, but not too much. Behold, there were some that did lie there, and even through the Popper’s heat was alike unto all, some did just bask in the oil and keep everything that they had unto themselves. And so it came to pass that those which had given of themselves did bring forth much joy and delight to many munchers. But those which kept of the warmth and did not bring forth were only cast into the pail and thought of with hardness and disgust. And thus we see that in the beginning all appear alike, but when the heat is on, some come forth and give all, while others fail their purpose as chaff, so as to be discarded and forgotten.